I was a teenager before I first even knew about the Holocaust. My parents never told me about it, and as a baby boomer growing up in the 1960s I didn’t learn about it in school. The numerous Holocaust museums that have sprung up in recent years didn’t exist either. Learning more about the Holocaust was one of my reasons for going on this trip to Poland with my sister in the spring of 2017. Carrie and I didn’t plan our trip to spend Yom Ha Shoah/Holocaust Remembrance Day in Poland but I am glad we did. 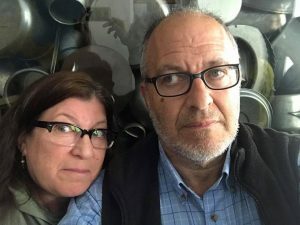 Last year she and I were in Israel for my daughter’s wedding, and first I want to tell you about that experience. The day is a normal working day in Israel, as it is in most places around the world. Most of you probably don’t give it much thought or if you do this year it is because of certain ridiculous remarks earlier by Spicer. But in Israel there is a moment where everyone stops what they are doing, and sirens go off. You can’t miss it. I was walking around the center of Jerusalem with my friends, doing the normal touristy things that one does there. Traffic all over Israel comes to a standstill, and some people get out of their cars. The normal sounds of the city are replaced with the sounds of nature. It is somewhat eerie, somewhat beautiful, somewhat odd. You certainly will remember the moment if you are there. Carrie and her family were driving near Tel Aviv and listening to the radio, where the announcers tell you what to expect. (They are speaking Hebrew, so it didn’t much help her.) If you are on the freeway, people start pulling over early. If you have seen any videos of this, it looks like a science fiction movie. But it is very real. Anyway, that was last year. As I said, this year Carrie and I were in Poland. We were in Krakow, and walking around the city. I wish I had gone to Auschwitz but we were told (incorrectly) that the site would be closed to the public and only people who were part of the March of the Living, which happens every year on that day, would be allowed in. I heard 20,000 people attended this march, but can’t verify that figure. We did get to go to the site the following day and I have posted some thoughts about that elsewhere. While in Poland, I thought about the first time that I learned about the Holocaust — it was when I was 15, and with my family to visit Israel for the first time. We went to Yad Vashem, the museum of the Holocaust outside of Jerusalem. At that time it was a much smaller facility but the little that was there back then was very moving. As I said, I had no idea about the Holocaust– my parents weren’t direct survivors but both of their families had many members who perished then and they just decided not to say anything to their kids. I remember how annoyed I was about that decision and glad that at least I had some solid foundation to learn more. Part of that desire was why I was motivated to go on this trip with Carrie — I wanted to see more of what happened during wartime firsthand. It is one thing to read books about the Holocaust and I have read many of them: some non-fiction, some deliberately fiction (meaning not written by deniers but using wartime fictional settings to tell a story). It is another thing to actually live in Europe and be reminded of this era all the time. Granted, a lot has changed: cities have been rebuilt. Monuments erected. But there are a lot of memories captured in many different places and different ways. These blog posts and pictures are to document my own search. I can’t imagine what it must have been like, to be sure. I am glad that I went on my trip to Poland. There is perhaps no more complex Holocaust story than there: the country was quickly occupied by both Russians and Germans, saw many casualties of Jews and non-Jews, housed many of the concentration camps, and had many cities obliterated at different times. My trip was a beginning for me to learn more about our family roots, and start to see both the bigger picture and some of the nuances about those times. What makes it hard when as a Holocaust tourist is the delicate balance between being morbid and sympathetic, being understanding and being judgemental, being nosy and being inquisitive. I learned a lot this past week. Many Jews are taught to ask a lot of questions. (If you have any doubt, try one of this series of books in The Jewish Book of Why, one of my favorites.) That is how I dealt with, and still deal with the Holocaust today. This trip has raised many more questions than answers for me, which is a good thing. It is a delicate balance because we didn’t live through it, and can’t possibly comprehend the horrors of the times. But I think it is important to learn more, which gets back to my frustration with my parents about not saying anything to us when we were growing up. That was their way of dealing with their loss, and I have to respect that. I think Israelis have the right idea and glad that my daughter is getting their perspective first-hand. Take a few minutes out of your day, think about what happened during then. And if you have questions, find your own answers.